New York Times photographer George Steinmetz and American University professor Evan Berry sat down to discuss the intersection of religion and climate change and how narratives around climate change have developed over time. Co-sponsored by the Berkley Center for Religion, Peace, and World Affairs and the Pulitzer Center on Crisis Reporting, the event “Religion and Climate Change: A Visual and Scholarly Representation” highlighted breathtaking photography from “Losing Earth,” the New York Times Magazine story that took an entire issue and depicted the drastic effects of climate change today. 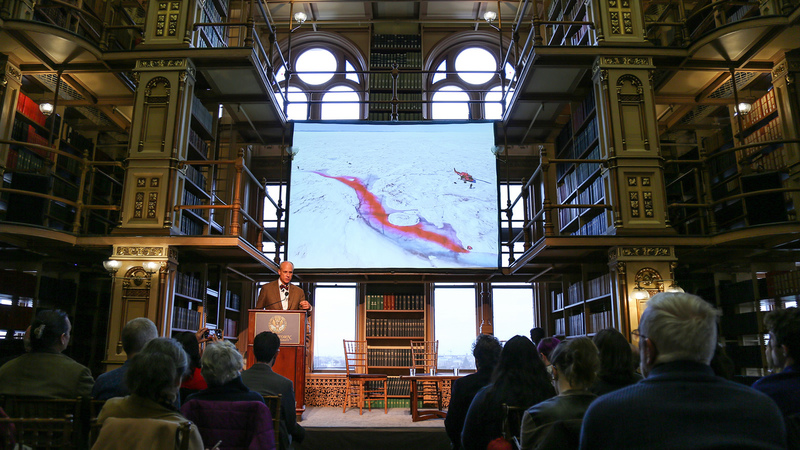 George Steinmetz, who took stunning aerial photography for the project, opened the event by providing an overview of his photographs in “Losing Earth,” which feature the most dramatic examples of climate change on every continent. From the largest coal mine in China to dissolving ice sheets in Greenland to the aftermath of Hurricane Harvey in Texas, Steinmetz’s photography depicts a haunting view of the effects of climate change. 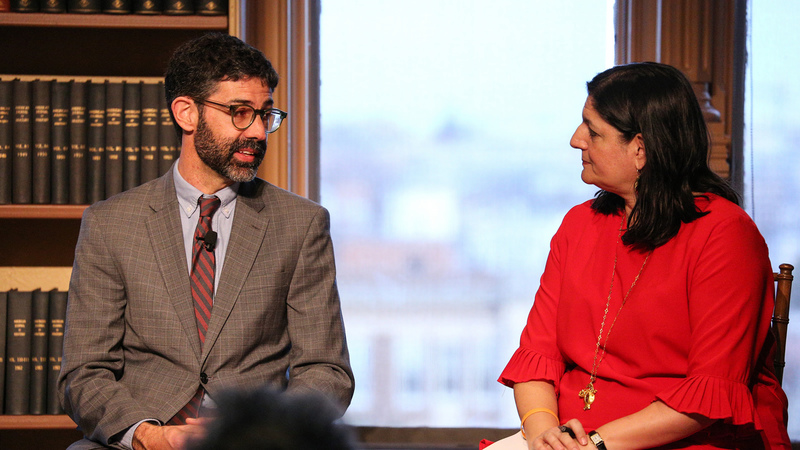 Evan Berry, who focuses on community action and the ways that religious ideas are mobilized in response to climate change, joined Steinmetz on stage for a discussion moderated by Pulitzer Center Executive Editor Indira Lakshmanan. Lakshmanan asked poignant questions about religion and climate change solutions, the United States’ moral obligation to other countries, and the challenges of communicating climate change issues to the world. In a number of places, particularly in Catholic countries, you see trends to support the Pope’s view on climate change. There’s this idea that religion and ethics derive from Catholic social teaching, and that can be a resource for the way we combat climate change. When Lakshmanan asked how religion could potentially be harnessed for a solution, Berry posited a new kind of thinking: “What I would submit for our collective discussion is that maybe [religion is] not something that just exists that we can link up to other kinds of conversations, but is in fact a more dynamic and less predictable way we respond to public issues.” As an example of religion's multifaceted influence, he noted that in the United States, religion is often associated with climate-change deniers, while abroad religious beliefs have inspired foreign movements that advocate more simple and austere lifestyles that reduce people's environmental impact. We’re taking a lot more than the Earth can put forth. I think it’s not fair to blame the Chinese for trying to have a lifestyle we have in the United States. I think we all have to look at what we can do individually. The panelists also discussed how climate change causes damage beyond its immediate environmental impacts. Global conflicts, for example, are often related to the problem of diminishing resources, as is the case in countries like Mauritania and Syria. "The tensions themselves are politically and socially constructed, but they’re ignited and exacerbated by mounting environmental pressures," Berry observed. "I think we’re likely to see much more of that in a world that’s warming over the coming years." George Steinmetz describes taking a photo of dissolving ice sheets. 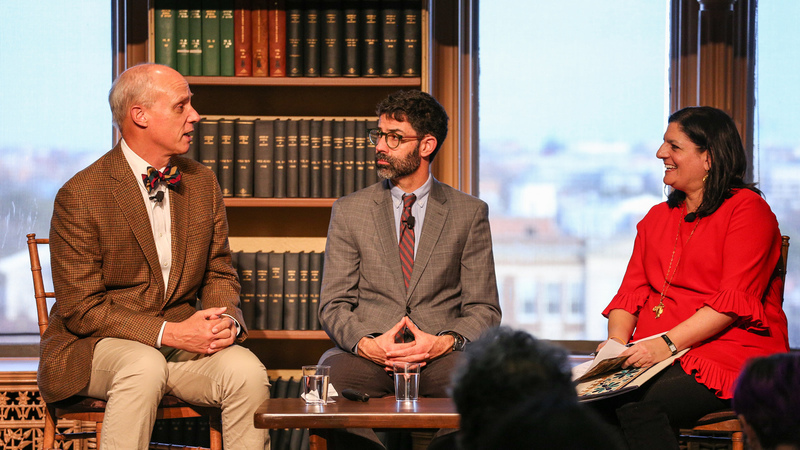 George Steinmetz, Evan Berry, and Indira Lakshmanan discuss how journalism can inspire action on climate change. Evan Berry and Indira Lakshmanan consider the diverse ways religious communities are responding to climate change. 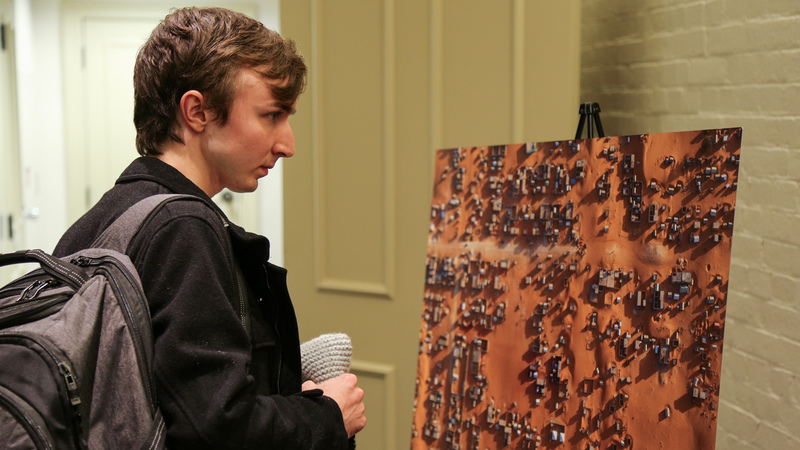 A Georgetown student examines one of Steinmetz's photographs portraying desertification in West Africa.